Tryptic is a dialogue piece between my parents and myself. My father has studied graphic design, but worked as a travel agent his entire career and has recently retired. My mother is a philosophy professor and author, but started making drawings in her late forties. They have been divorced for over 20 years. After finding some old drawings from my father on the attic, I recognized my own way of working in them, using pen and ink, patience and hard work. My mothers work has the same qualities but with a very different result. I decided to try and make a work combining all three. I cut 3 pieces of paper in the same size, made a drawing on the first and asked my father and mother to each respond to my work on their own piece of paper. On the left is my father's response, on the right my mother's. Because of the very intimate nature of the work and its unique position within my oeuvre, I had decided in advance never to sell it. After a couple of serious enquiries from prospective buyers specifically for this work, we have agreed to make a limited number of prints available. This museum quality reproduction (Printed by Fotorama Fine Art) uses light and colorfast ink on acid free paper. The three pieces of the tryptic will each be framed separately in an acid free oak frame. Only ten prints will be made, each signed an numbered. I am very proud to announce that Construction II will be shown at Katoen Natie HeadquARTers during the Museumnacht Antwerpen. HeadquARTers selected this work through a competition with 500 entries, 60 of which aiming for this location. Construction II will be displayed solo for a full week. As a performance, I will be installing the construction between 7 and 10 pm on the 6th of August. Don't forget to swing by on your Museumnacht tour! When we produced Construction I in white sandstone, the manufacturer made 41 cubes more than necessary. These 41 cubes are not needed for the construction itself and were left untouched in my studio for many months. As I am unable to refrain myself from making constructions with anything I can lay my hands on, I started making a series of drawings based on the varying constructions I could make using these 41 cubes. The rules are simple: each time I build a new construction using all 41 building blocks. 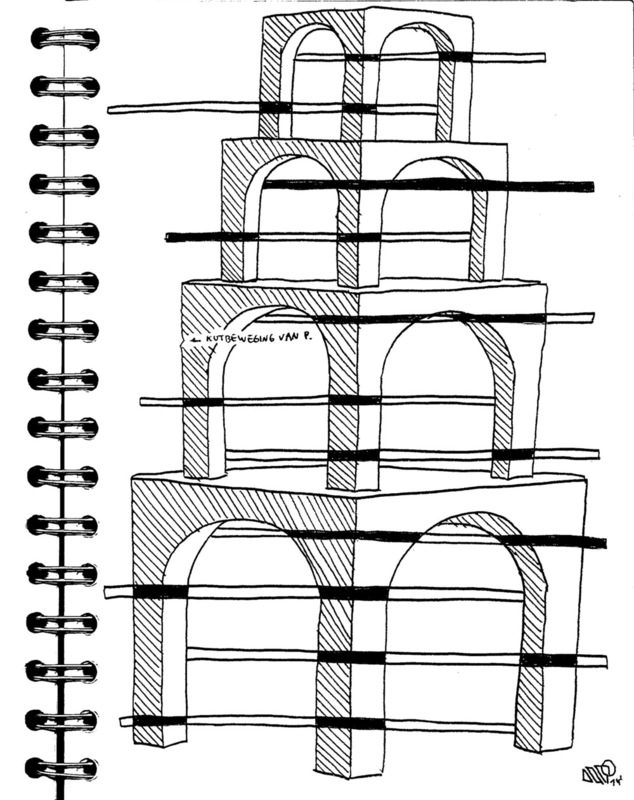 After sketching, I then draw the four side views and superimpose a perspective drawing of the construction. I then carefully draw the lines for the background. 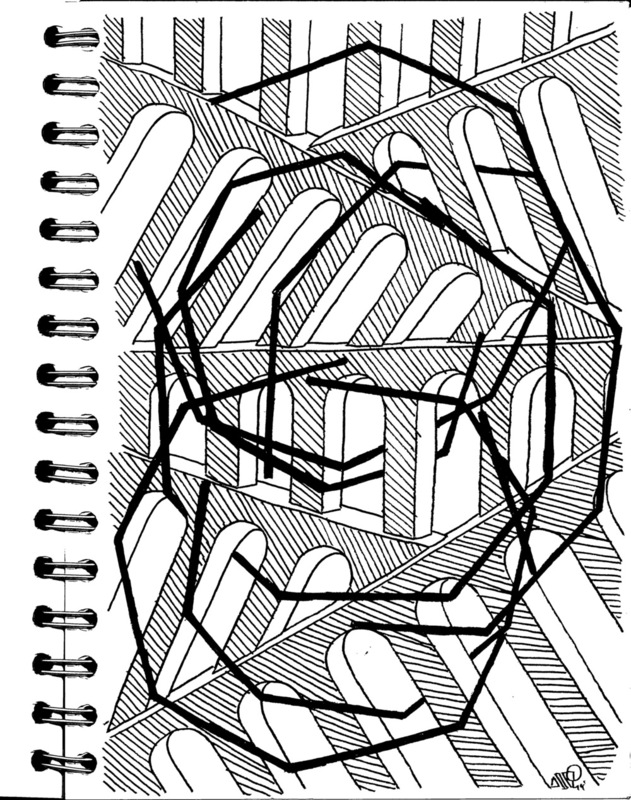 By early October, I should have 41 unique drawings of 41 the different constructions that have each only been made once and then destroyed again. Each drawing will be sold with one of the individual building blocks. 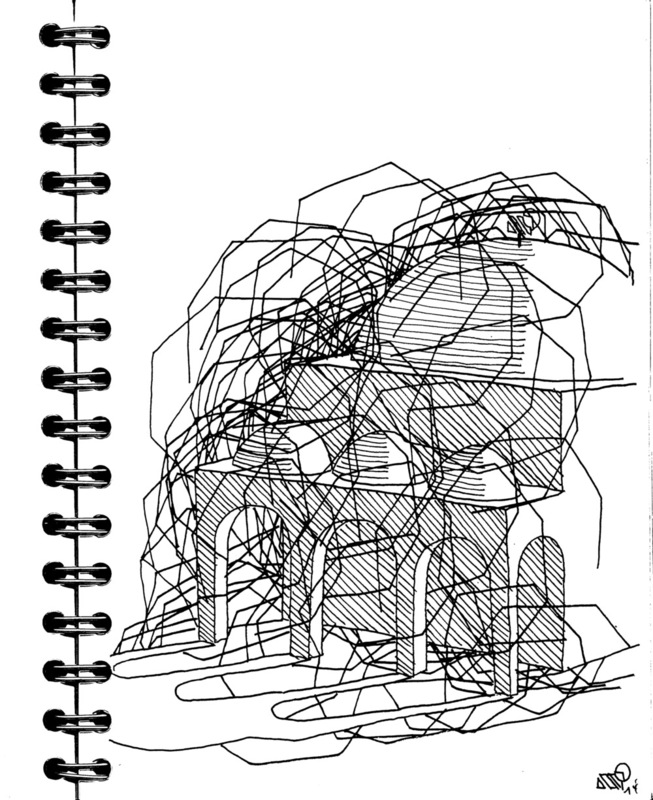 In October, I will present the work in full: a construction using all 41 building blocks and the 41 different drawings. More information on this project will follow in September. 10 years ago I made a series of approximately 50 black and white photographs. I printed them myself, using a gelatine silver printing process. 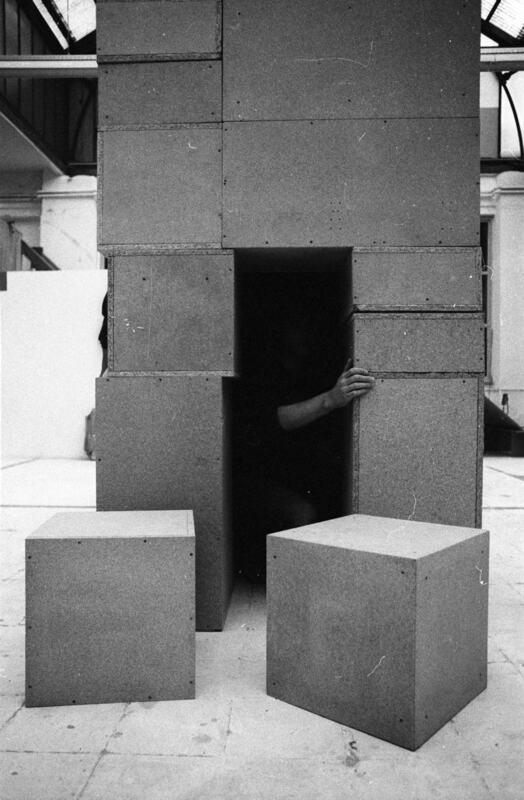 The photographs show different setups of my large Cubicles installation I started as an art student. I still work with these Cubicles and each time I show them I produce more. Recently I've been trying to work these photographs. Amongst the 50 photos I found this self portrait and started working on it with brush and ink. I'm not sure yet what these will become, but I will work on a couple of them to find out. Hands can bear a broad scope of meanings. I use my hands to draw, to sculpt, to stack objects. More than anything, they are the tools I use to see and build my world. While documenting Construction II, photographer Cedric Verhelst decided to take some pictures of my hands to give a sense of scale to the Belgian fossil building blocks, which range from 1,4 kg to 5 kg. I am happy to present a limited edition of 5 photographs showing close-ups of Construction II. Each of the 5 photograph will be for sale in a limited edition of 5 prints each. We are using the high quality Platinum Paladium printing proces, an amazing photography process which can really only be judged on the actual print. We've had ours printed by Manuel Gomes Teixeira, a specialist based in Aveiro, Portugal. The photographs are made by Cedric Verhelst, a young and talented photographer from Ghent with whom I have worked before for documentation and process pictures. Each of the photographs will be framed in a museum-quality frame with anti-reflecting glass. They will be signed and numbered in crayon in front and with ink on the back. Each photograph will be sold with a certificate signed by the artist and the photographer. In November 2015, I took residence into a new and fantastic studio: a gorgeous 60-square-meter space with 5m-high ceilings, flooded with natural light. The space is the former principle's office of a disused Veterinary School which was empty for 20 years. Nucleo is an organization seeking out spaces like this and turning them into temporary (1-5 years) artist studios. The gorgeous interbellum building by Ghent architect Valentin Vaerwyck now houses 17 individual studios and a large shared studio space, as well as an exhibition space. Construction I and Construction II are on show in the Nylonfabrik in Sint-Niklaas / Belgium until 22 of October. The finisage will be held 17 of October. During this event I will be working live on a drawing from 10am till 6pm. At the beginning of September 2015, I travelled 1400 km to the charming Tuscan village of Volterra for a an intensive one-week sculpting course. Even though I've actually got a master's in Sculpting, I've never really carved in stone. During my training and after that, I mainly focussed on installations, drawings and performances. So this week in Italy was my first real experience with working in stone. 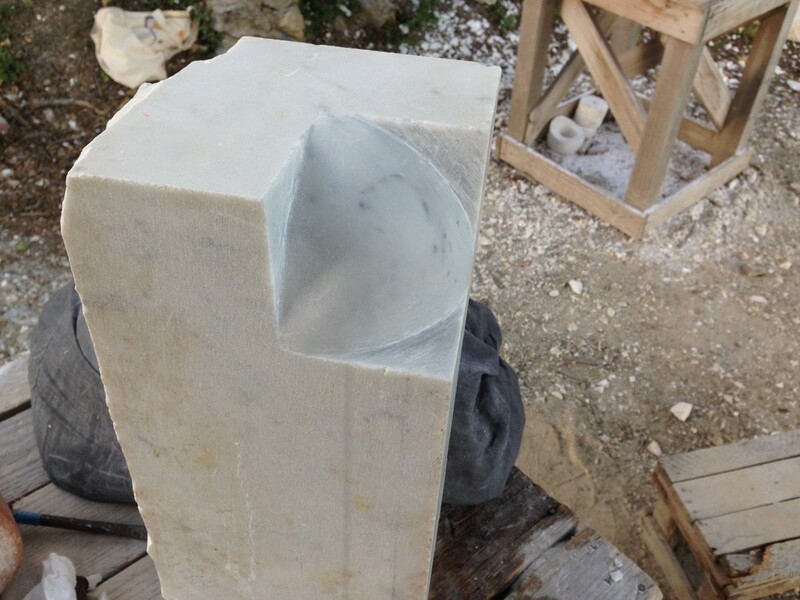 We've worked in alabaster from the Volterra quarries and marble from the Carrara quarries. The resulting piece can only be presented as an exercise, not as a finished work. The slideshow above shows the process of carving a first corner and after that 1/8 of a sphere. My interest in geometry proved an asset: a nicely rounded surface can only be reached through facets, like the faces of a diamond. By gradually working from larger to smaller facets, the stone eventually curves. The final step is then to sand the surface. 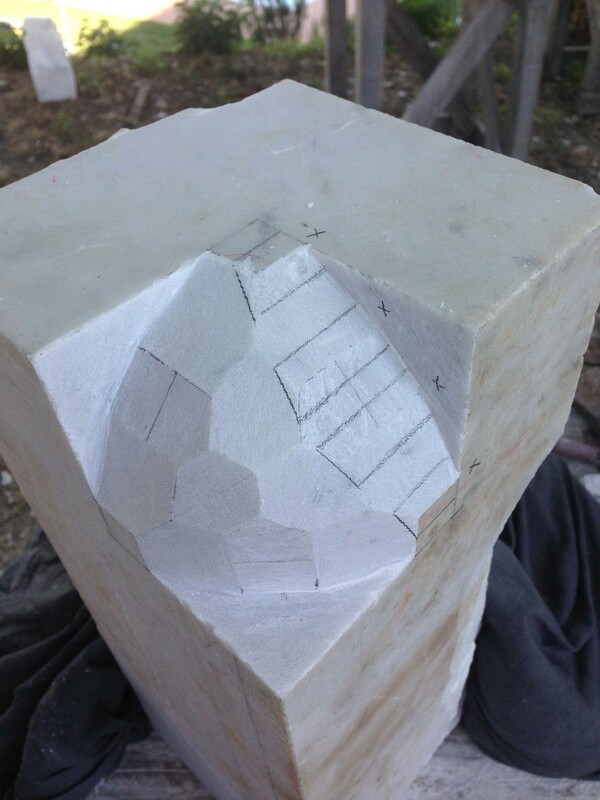 After the 1/8 sphere was finished, I started freewheeling a bit, drawing on and cutting into the marble, experimenting with shapes and techniques. The final 3 photos show the sculpture exercise in its current shape. Now to buy a set of chisels so I can work some more on it in Belgium. I’ve always made installations and sculptures as well as drawings. You can obviously see this on this website. Both art forms influence each other in ways that not even I can always predict. The outcomes of this dialogue are part of what propels my work and its evolution forward. 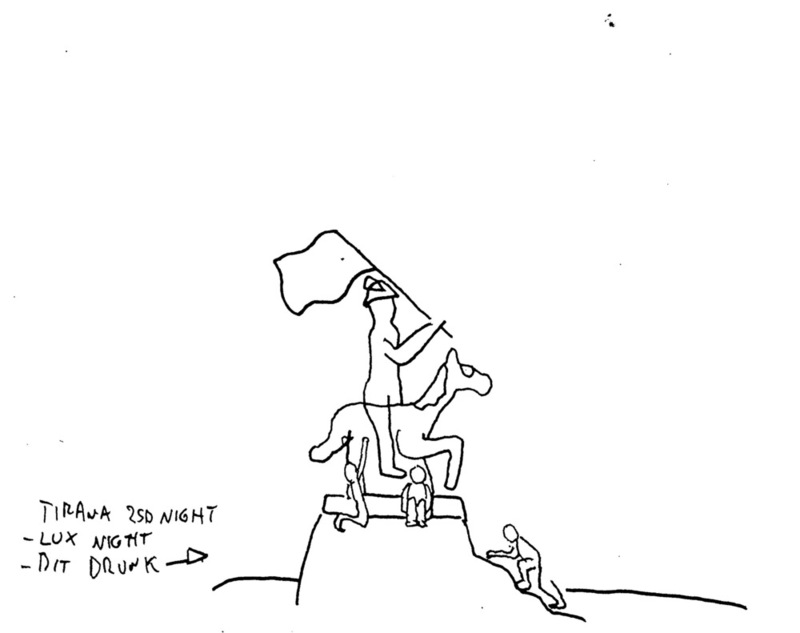 But no matter if I’m drawing or making installations: I always feel a sculptor. Very recently, for the on-site works made for DOK, I’ve experimented with the techniques and shapes I’ve developed in the spatial studies on a much larger scale. The work was made in polystyrene for practical reasons and will be transferred into concrete later. I really enjoyed this whole process and feel ready to take this further. 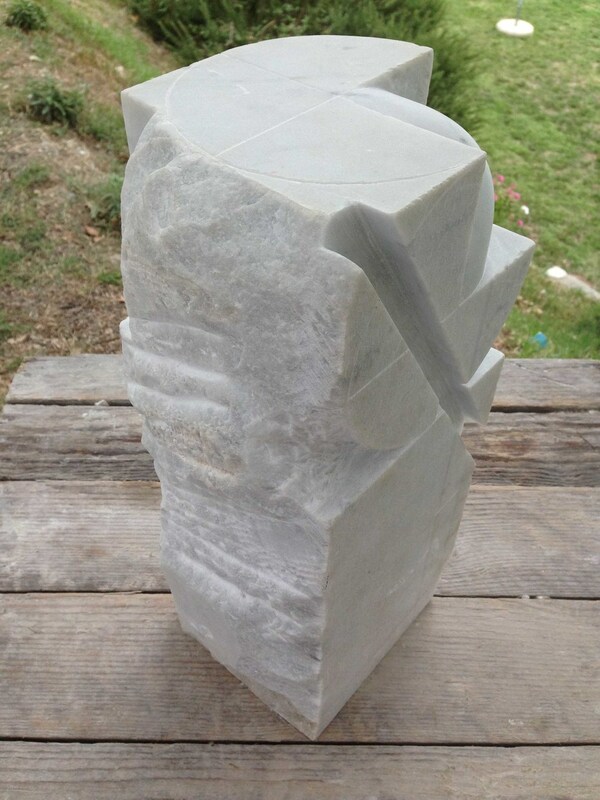 I’m excited to announce I will be taking a stone-carving course in Carrara, Italy, to study how to transfer these shapes to stones and marbles. This is a logical extension of the very material aspect in my work, from the heavily grained paper I work on for my drawings to the sandstone used on Construction I (and the Belgian blue stone for Construction II which is in production). I will continue to work on all my on-going artistic projects; the “untitled” drawings, the spatial studies, the Construction series – and of course continue to evolve and develop new work. In Ghent, the first of May traditionally marks the opening of the festival season. Throughout the summer, the city is host to a range of festivities, culminating in the Gentse Feesten, a ten day city-wide festival. The festival to kick off the season is DOK – a five-month freezone for art, recreation and creative manoeuvres, at the old industrial harbour of Ghent. This year, artist platform BLANCO invited me to make an on-site intervention with one of the buildings. I made three works for the site, which cover three of the building’s (obsolete) windows. 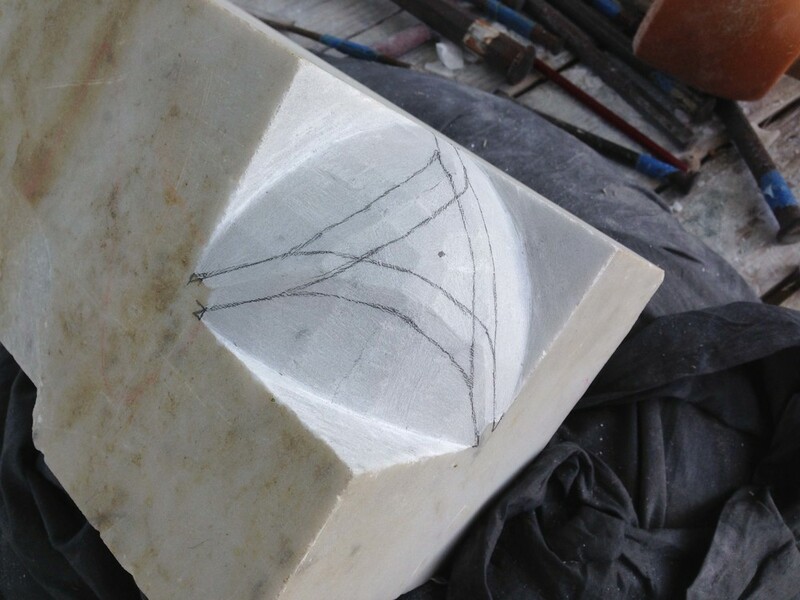 There is a white geometric sculpture, which almost seems to be growing from the old concrete, and two freehand drawings on whiteboard echoing the shapes of the sculpture. The sculpting process of the carving followed the same as with my on-going spatial studies: starting from a solid block and cutting away material. Since this one had to be mounted and fixed to the window - and be weather proof - I decided to cut it from a cubic meter block of Styrofoam, which was then painted white. It was my first experience with a more traditional form of sculpting at this size. I’m now exploring possibilities of having this work cast in solid concrete, and am looking to make more works like this in other materials. My work can be viewed at DOK Ghent from 1 to 31 May. I’m very proud to announce that the Paris exhibition at Oneiro Gallery has a solo follow-up at the offices of Homère Avocats. 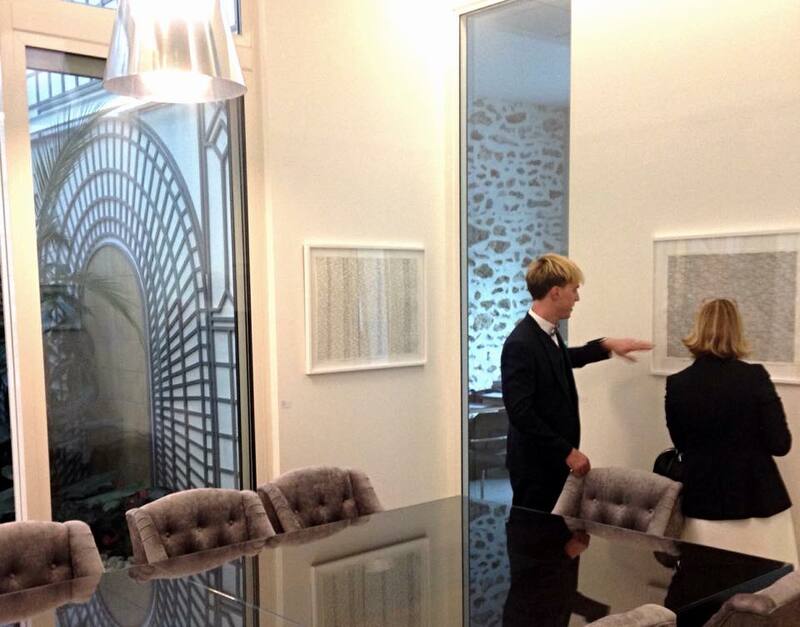 About 15 works are exhibited in their Paris offices. There was a private opening of the exhibition where I got the chance to talk about my work to the lawyer’s clients, giving some of them a private tour. The works will be displayed for two months, but unfortunately the exhibition is not open to the public. TumultInGent is a Ghent one-day art manifestation, organized by student radio broadcaster Tumult. For the third year in a row, they invited me to join the 200+ artists and musicians performing and exhibiting throughout the city. I decided to show Construction I for the very first time, since my exhibition spot seemed ideally suited. A glass tower overlooking the city’s towers really showcased the work in sandstone, echoing historic architecture and playful children’s building blocks. Tumult in Ghent had 17.000 visitors this year: an amazing feat, mainly thanks to the organising talents of Bert De Geyter. I was doing a bit of clean-up in my atelier last week and found these. I took these pictures with my old Nikkormat camera while still in art school, probably in 2006. I never did anything with them back then, but they mark the first time I ever considered my wooden play blocks for artistic purposes. Construction I is the latest execution of work that builds on these roots. Proper art needs a proper photo shoot. New pictures and new work coming up soon! The exhibition "Did you say Abstract" opened in Paris the 4th of December, collecting work from Conrad Willems, John Franzen and Gyula Sági. Conrad Willems is showing seven drawings including some very recent ones not shown before. The three exhibiting artists are friends. 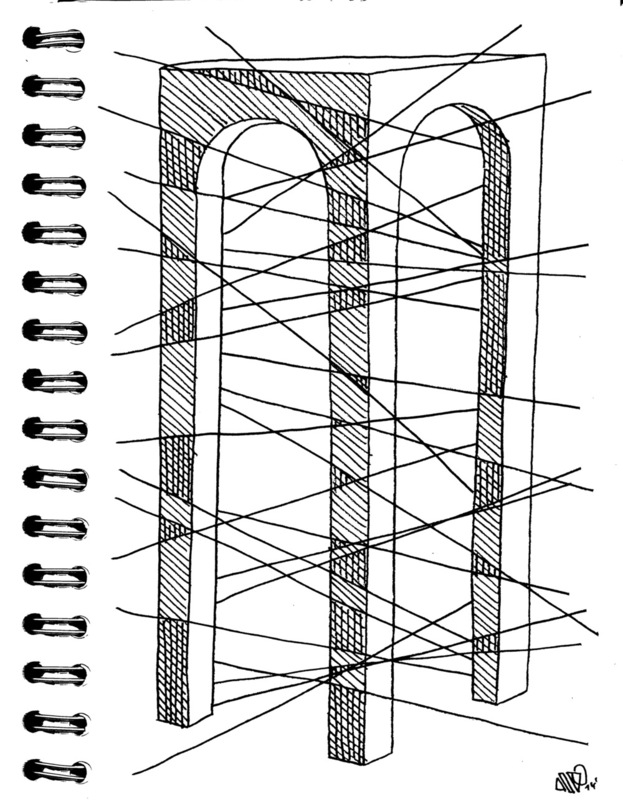 They're showing work that refers to "serialism", using techniques like consecutive repetitions and repeat-drawings in freehand black ink. Together with Gryanne Stunnenberg, they form an artist group called "Serialists", promoting the artistic movement of Serialism since 2014. You can visit the gallery in the charming Le Marais neighbourhood from Tuesday to Saturday, 10:30 to 19:00. Conrad will be visiting regularly, so don't hesitate to let him know if you're visiting as well! For more information, visit Oneiro's website or Facebook, or the dedicated Serialist page to discover the other artists. An artist often gets to see all kinds of places. The stone company I'm working with for my "Construction" series has the most amazing work space, with hundreds of huge slabs of exquisite rare stone. On the 14th of November 2014, 'Without title' was sold at an informal auction at TUMULT in KERK. The aution was an initiative of TUMULT in support of young artists in Ghent, Belgium. A total of 20 works were successfully sold. 'Without title' - a one-of in white ink on black paper - was made especially for the auction and found its new home after a good bidding run. For the cultural event 'Cultuurmarkt' in Ghent, I made one of my cubicle performances in collaboration with the Ghent City Museum STAM. The entire construction performance took 5 hours, with a final height of 8 meters. Don't worry, I've sped things up just a bit for the video. In August 2014 I made two road trips. One through France and one through the Balkans. Instead of taking photo's I took my sketchbook along.